Would a Monorail Suit Your Facility? 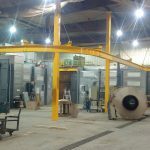 Monorails are often used in industrial manufacturing facilities as part of a complete lifting solution. One large benefit of monorail lifting systems is that they can be mounted directly to the facilities ceiling – freeing up floor space for the product and the lift. Ceiling mounted monorails use existing ceiling structures – eliminating the need for columns opening up valuable production space. 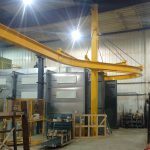 However; unless the structure of your building is purpose built for ceiling cranes, you will need the services of a structural engineer in determining the capacity of your existing ceiling (and other structures in the facility) to determine if a ceiling mounted monorail industrial crane is possible. Ceiling mounted monorails are designed with clamped suspension hangers and easy-to-install sway bracing (when required). 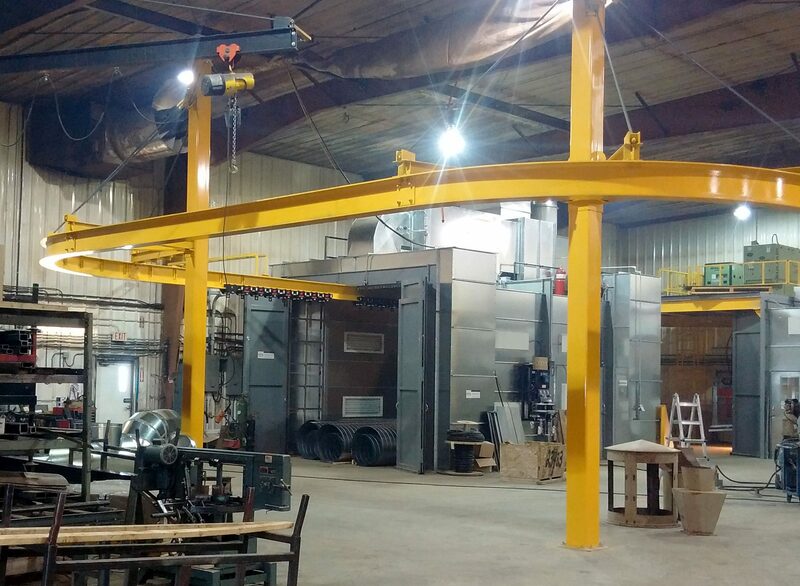 Some monorail overhead cranes may bolt directly to an existing ceiling or other support structure. Other situations may require the monorail to hang lower in order to avoid obstructions such as lights, heaters, pipes, etc. using engineered support hangers (drop rods) and superstructures to lower to monorail. Curved rail sections are available for navigating obstructions or for creating a process line for the lift. 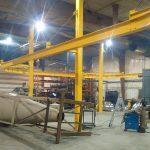 Ceiling hung systems are the easier method of installing a monorail system in your facility but where that isn’t feasible, due to ceiling weight restrictions or other limitations, a freestanding cantilever or H-frame application may be the answer. 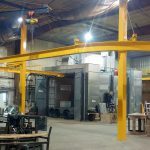 These options don’t rely on your structures support capabilities and instead use floor mounted columns to support the load. Monorails can utilize most hoists, balancers, powered or manual, systems. 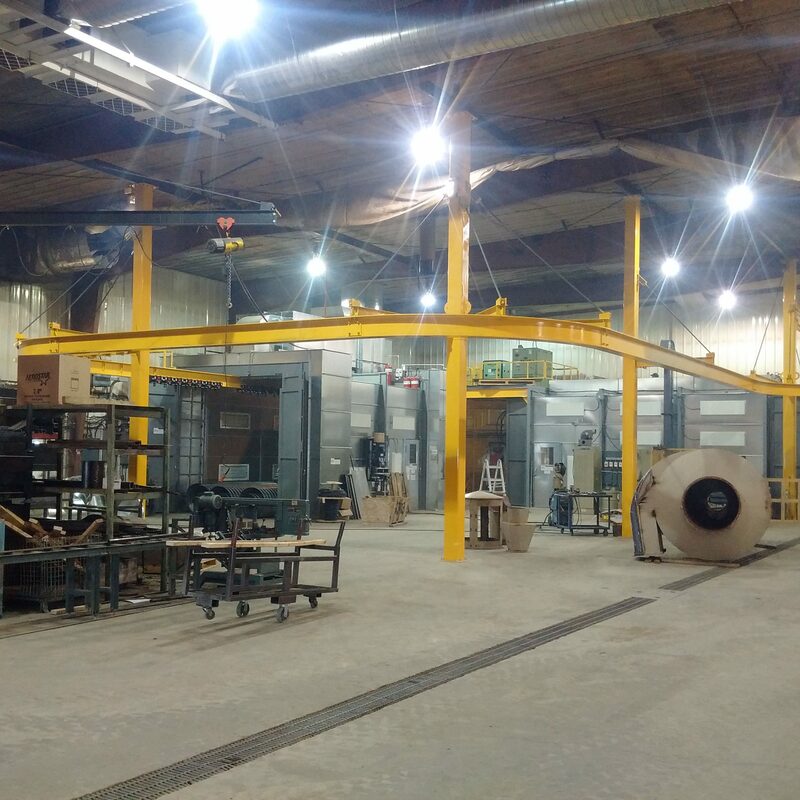 By customizing your monorail you’ll make your operations more efficient, versatile, and safer. Take a look at this comparison infographic to see how a monorail system stacks up against other systems. Specific to monorails, there are features that you should be aware of that may benefit you over a freestanding crane system. Ceiling mounting frees up floor space. Monorails are best suited for transferring a load throughout a facility along a fixed path and not for processing or work manipulation of the load. Loads in a monorail system have mobility only directly under the monorail hoist (no lateral movement) so they are best suited to moving loads between work stations and not for manipulating the load at the work station. Loads are typically lifted up, and then physically moved along the monorail by the operators (the hoist is pulled along the rail via trolleys holding up the load), however; there are powered automated monorail hoist systems too. Typically we see many industrial complexes using monorails to “walk” a load to different locations. The path a monorail can take is very flexible. Corners and curves are possible as is some grade changing. And with an enclosed track system required maintenance of the trolleys are kept to a minimum. 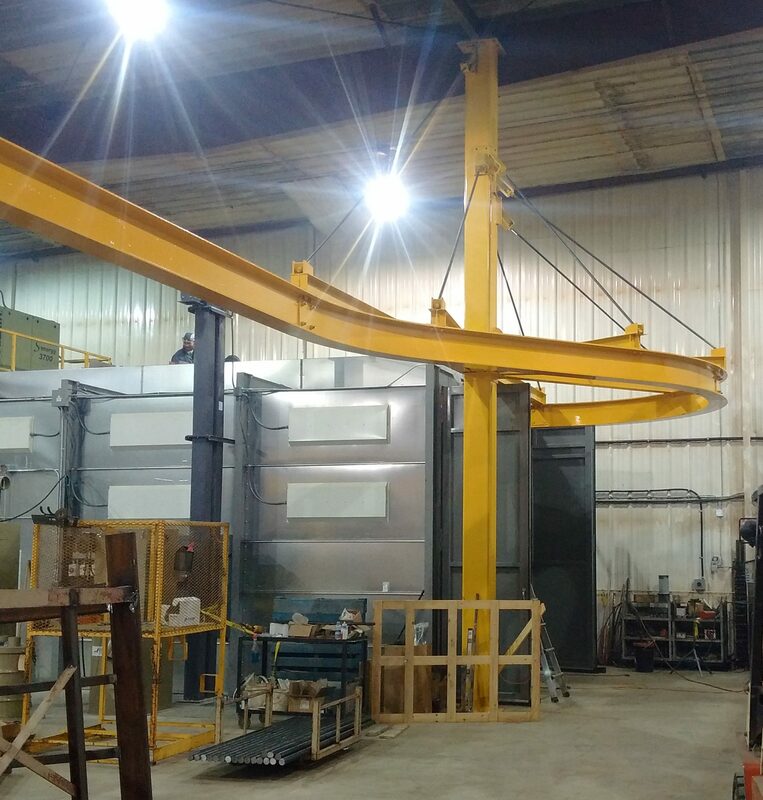 Relatively small, but crucial for operations, is this 19′ ceiling hung monorail above a manufacturer’s plating work station with a EDL10ST-10-10-15 KITO chain hoist. It’s not a specific industry that uses monorails rather it is the process in manufacturing that dictates it. Paint lines are a prime example of processes that use monorails. In monorail lifting situations the load is stationary (or very slow moving) while the processes are applied to the load. Other examples would be cleaning of loads or of drying of loads. 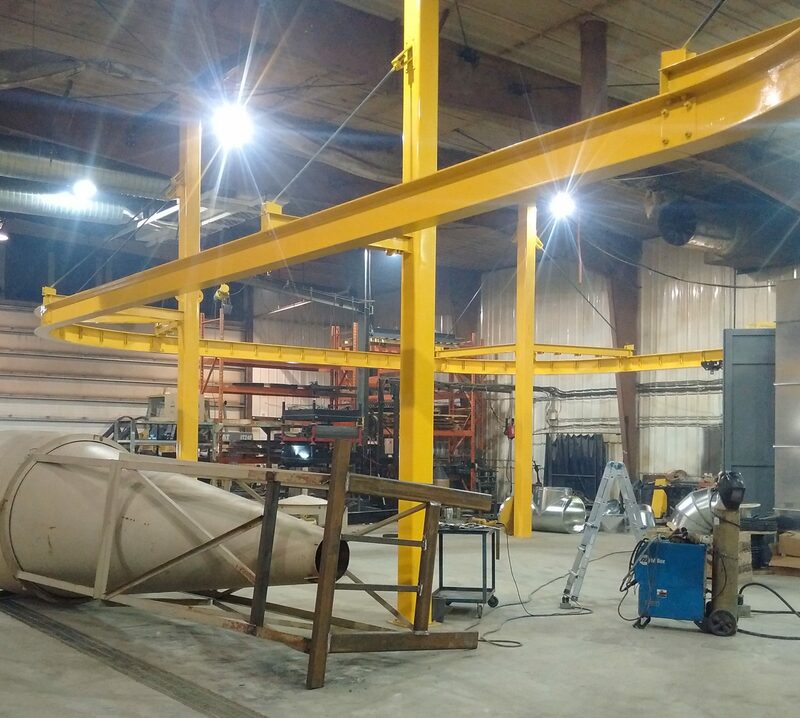 Other lifting solutions that manipulate the loads to a greater extent and pass product onto the next phase of manufacturing, such as in steel brake work or welding, may benefit from a monorail. 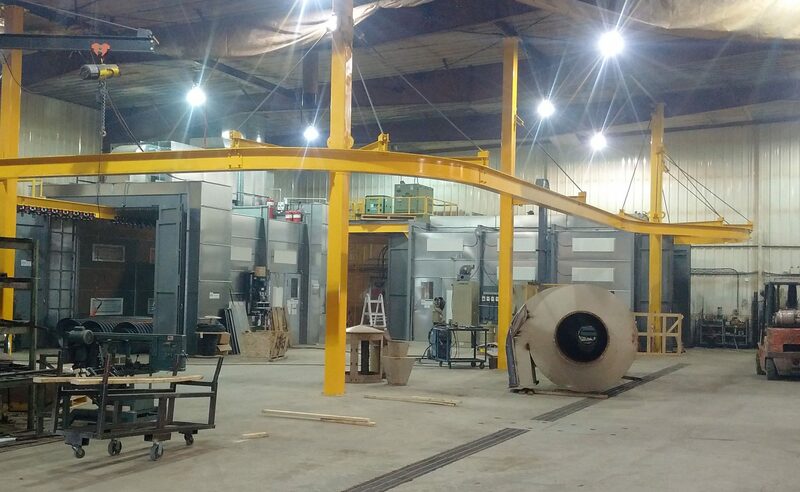 Manufacturer’s plans dictate monorail installation and not the industry itself. We’d love to meet with you to formulate a strategy for your workplace that meets all your requirements and ultimately, keeps your workers safe and productive. Schedule a demo or contact us in Saskatchewan or Manitoba for additional information.